Blossoming from the brush of Rubens, Achilles’ life force has rooted itself ever more deeply into history, propagating itself onto sumptuous tapestries, prized possessions adorning European palaces and national museums. Selecting eight defining scenes from the life of Achilles, Peter Paul Rubens (1577–1640) poured every ounce of his artistic virtuosity into his masterpieces of Western Civilization’s earliest and most enduring hero. In one for the angst-filled bucket list of lost opportunities, I lately learned that I missed the perfect chance to see them all together in a wonderful museum exhibition, Peter Paul Rubens: The Life of Achilles. All eight of Rubens’ scenes were presented in a comprehensive exploration of the artist’s personal interest in Achilles, the visual and literary resources influencing his work, and the technical aspects of executing these incredible masterpieces. A full suite of finished works, carefully preserved since the last half of the 17th century, were on display. This incuded all of Ruben’s original oil sketches on oak panels, several of his lavishly painted modelli used as references for the weavers’ looms, and many of the original, richly executed tapestries were displayed, as well. This amazing exhibition took place in the Netherlands at Rotterdam’s Museum Boijmans Van Beuningen from 30 August to 16 November 2003 and then moved to Spain from 9 December to 19 February 2004 at Madrid’s Museo Nacional del Prado. According to Lammertse, as reported in the catalog publication review by University of Cincinnati’s Kristi Nelson, Rubens’ father-in-law may have been instrumental in the commissioning of these works. As a top-tier tapestry merchant, Daniel Fourment was closely connected to the Life of Achilles series, and the provenance of many of the original sketches and tapestries is listed as his home. Lammertse explains that Rubens conceived of tapestry as not just individual pieces, but as a comprehensive whole. The architecture of the client’s home or palace where the tapestries would hang was a critical factor in the creative process and final designs. Delmarcel notes that various famous workshops in Brussels produced their own editions of the Achilles tapestries. Different border designs were often used, perhaps to more closely match the tastes of diverse clients. Healy suggests that Rubens was likely influenced by original texts, as well as Renaissance publications, for narrative details included in his designs. She stresses the brilliant intuition Rubens displays, producing designs that visually express both the human and heroic qualities of Achilles’ character. As you view the following images, take note of the visual content of the eight separate scenes. 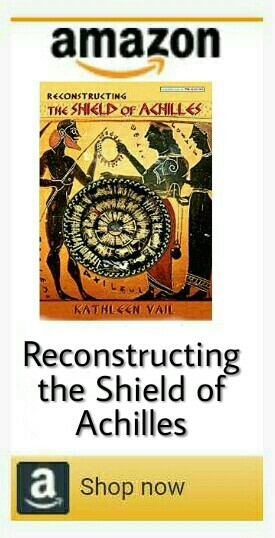 Are these the key scenes you would say define the fame of Achilles? If you could commission Rubens, what else would you like to see? Also, don’t miss the caption details. You might find it interesting to follow the changes in size from sketch to modello to tapestry, and to notice the artistic changes in border designs as well as other design variations. 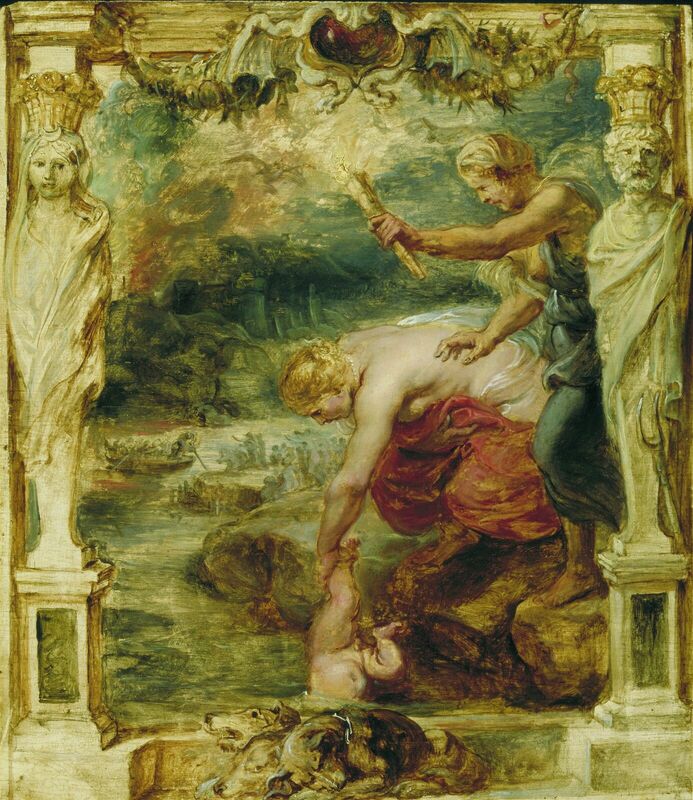 Rubens’ Sketch for Thetis dipping the infant Achilles into the river Styx, ca 1630-1635, oil on oak panel. (44.1 × 38.4 cm / 17.4 × 15.1 in) Rotterdam, Museum Boijmans Van Beuningen. Source: Wikimedia Commons. Rubens’ Modello for Thetis dipping the infant Achilles into the river Styx, ca 1630-1635. (size and current location not stated) oil on canvas. Source: Wikimedia Commons. With a monumental body of works numbering 1,403 pieces, not including the numerous copies made in his workshop, Rubens’ Life of Achilles series represents an almost insignificant fraction. And yet, despite the small number of pieces, the impact of Rubens’ contribution to Achilles’ perpetual fame is hardly insignificant. Blossoming from the brush of Rubens, Achilles’ life force has rooted itself ever more deeply into history, propagating itself onto magnificent tapestries considered as prized possessions by royals and art collectors alike. Adorning the gilded walls of European palaces and grand national museums of art and history, Rubens’ extraordinary artworks offer shining proof that Achilles’ prophesied fate is still flourishing vigorously. Achilles’ kleos aphthiton, or “unwilting glory” as eloquently translated by Prof. Gregory Nagy, is still perpetuating, still blooming gloriously, generation after generation, throughout the ages. Peter Paul Rubens’ Life of Achilles masterpieces are highly significant for contributing to this continuity, visually perpetuating our perennial love for Homer’s Shining Prince Achilles. 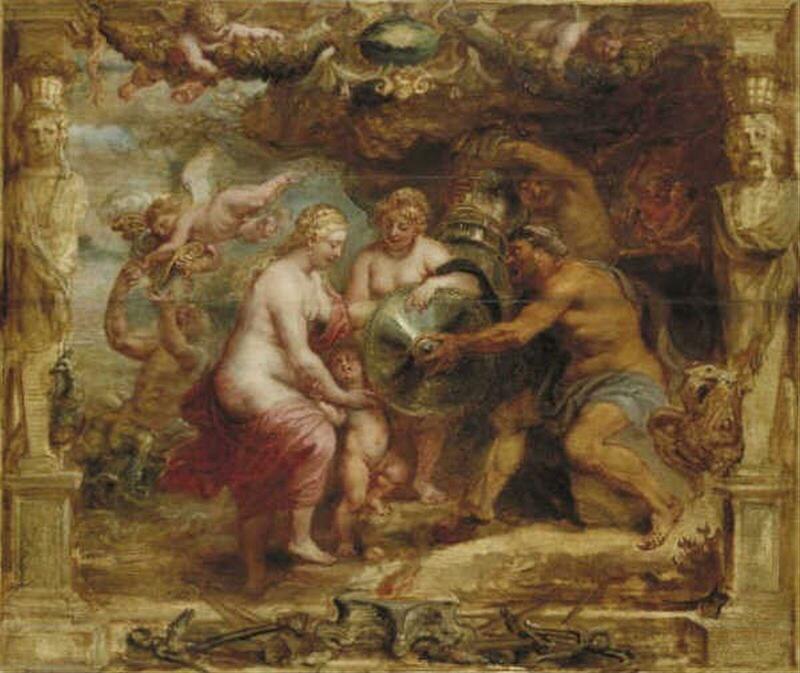 And, like the beloved bones of Patroklos mingling through eternity in the burial urn with Achilles’, Rubens’ reward is a similar kleos— his fate has become gloriously interwoven with the fate of Achilles. Thank you for such wonderful pictures, truly amazing ! and I love them all because Achilles is one of my favourite people. When I first moved to Crete I bought a a lovely bronze statue of him. It’s difficult to choose a favourite amongst these tapestries and paintings but I think I like the one “The death of Hector” maybe because it’s the most popular. Hope you are O.K. and enjoyed your visit to Egypt, or are you still there? Hi Kathleen, Of course I will send a photo of my statue. I think I have your e mail so will send it there O.K. When we visited Egypt a few years ago my partner John was ill for most of the time, not with a bug it was a serious throat problem, so he missed the Valley of the Kings. What is the situation in Egypt now, is it dangerous? Weather here in Crete is much cooler now and much more comfortable, for me anyway. Love your blog it is very professional and so interesting. Hi Rita, I’m glad you’re enjoying nicer weather now–this is also the best time to visit Egypt too. I found Cairo looking cleaner and safer this time more than any other time we’ve been there. It was quite surprising and impressive! A professional tour is the best way to enjoy Egypt with the highest degree of safety, though. Sorry to hear about John’s throat trouble, I guess that was really stressful for both of you. I’ve never been to Luxor-one of the tiny clauses in the fine print of my marriage contract, lol, noted that my husband has already sported so many family members and friends to the tourist traps that he is sick of it all! I finagled a good time in lCairo and Giza for our honeymoon and several beautiful trips to Alexandria, but time will tell if we ever book a trip to Luxor! 🐫🐫🐫 i’s definitely on my list, tho!